Training teachers: a unique experience! Are you a teacher and have you always wanted to volunteer? 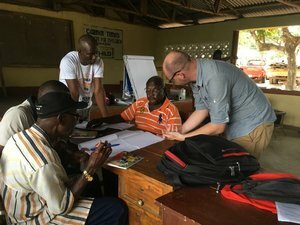 Our International Teacher Training Programme is a unique opportunity to mentor local teachers, improve education quality and make a difference to thousands of children in Sierra Leone and Liberia. It's challenging, rewarding and exciting. This is an opportunity to travel to the most remote areas of Sierra Leone or Liberia to meet other teachers who want to improve the quality of education in their schools. You can visit Street Child projects and get involved in educational work with teachers and children. The two-week volunteer programme is helping Street Child improve the quality of education in Sierra Leone and Liberia. With our education specialists, you work to give local teachers more confidence and involve students more in the classroom. Use your professional experience to exchange and learn more by teaching in a unique context. You have the chance to visit the most remote schools and see the impact of Street Child's work on the lives of some of the most vulnerable children. Go back to your classroom inspired and ready to share all your amazing stories. Street Child works to give vulnerable children in West Africa and Nepal the opportunity to attend school. We focus on building schools, training teachers and supporting families to pay for their children's education. Since 2010, Street Child has helped more than 17,000 children in rural communities in Sierra Leone attend school and trained more than 400 teachers. DO YOU HAVE THE PROFILE? By volunteering during your school holidays, on temporary leave or as a retired teacher, you can help us make a positive impact on rural education in Sierra Leone or Liberia. The International Teacher Training Program is a two-week journey. You stay in the local communities and get to know the country and its hospitable people. You travel with a group of teachers who all have the same goal and share the experience to discover the real West Africa. If you want to stay longer in the country, we can also help you by arranging a stay on the beach, so you can relax on a real bounty beach! Our International Teacher Training Programme packages cost 165 € per week and includes single accommodation, lunch, all project related transport and transport to and from the airport. You pay for flights, vaccinations (yellow fever vaccination is compulsory and you must take malaria tablets), breakfast, dinner, travel insurance, visas and personal expenses. We ask all our volunteers to commit to a fundraising target of 1200 €. Our professional fundraising team has materials and information which can help you achieve this target. We also encourage you to involve your school, so that the project has a larger support base. Give a few weeks of your Easter or summer vacation to change the lives of thousands of children in Sierra Leone. Do you want to register, or just find out some more information? Email us at intvol-eu@street-child.co.uk - we look forward to hearing from you! For updates from the field with photos and videos of some of our local projects!